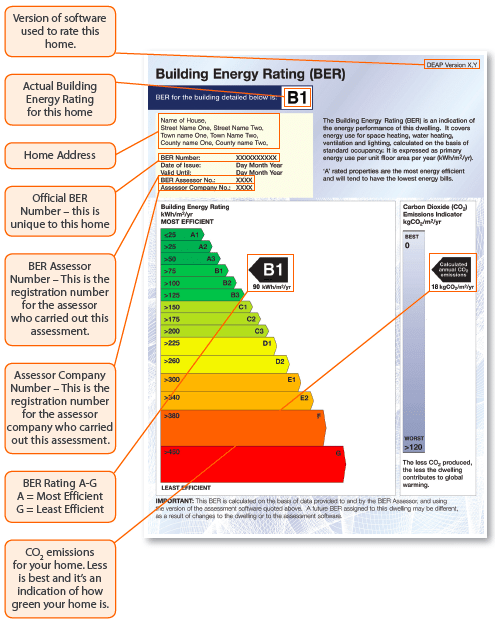 Ireland has a system to grade the energy efficiency of residential buildings, called a Building Energy Rating (BER). A BER is a standardized assessment of a property’s energy requirements for space and water heating, ventilation, and lighting, fewer savings from energy generation technologies. 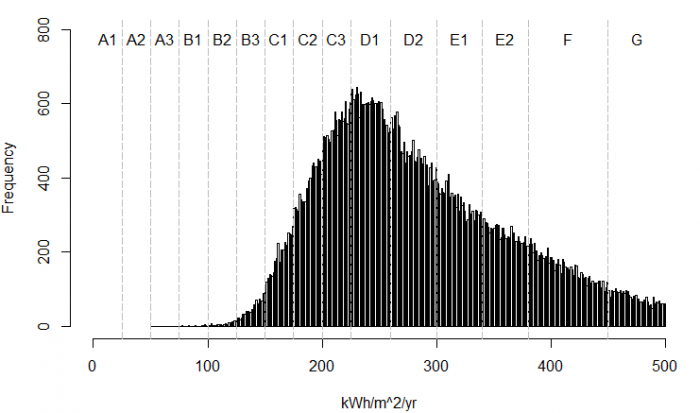 It is calculated in terms of kWh/m2/year of energy consumption from which a grade is assigned. The grade is from a 15-point scale ranging from A1 to G, with A1 being the most energy efficient. An example BER certificate is contained in Figure 1. A home with a high level of energy efficiency generally has lower energy costs for space and water heating compared to similar properties with low energy efficiency. Such properties are also considered more comfortable; for example, they may have fewer drafts, or it is easier to keep them warm. The value of these benefits has been capitalized upon in house prices and rental values with each point improvement along the 15-point BER scale associated with approximately a 1% higher price or a 0.5% increase in rental value [1,2]. The distribution of BER ratings from A1 to G is not quite a bell-shaped distribution, as there are more energy inefficient than energy efficient properties, but the distribution is relatively “smooth,” as illustrated in Figure 2. A government grant is available to homeowners to improve the energy efficiency of their properties via a range of measures such as attic or wall insulation, high-efficiency boiler installation, or heating control upgrades. When we look at the distribution of BER ratings of properties that have received the government grant, the distribution is no longer “smooth” and there are obvious spikes or bunching in the BER distribution on the “better” side of the letter ratings, as shown in Figure 3. The key question of interest is what is the cause of the bunching? Are homeowners and BER assessors fraudulently upgrading BER ratings to secure the benefits of higher property prices associated with better BER grades? Or, alternatively, are the letter grades encouraging homeowners to achieve the best possible energy efficiency rating when upgrading their homes? The research paper investigates this issue and finds that 4.5% of BER assessments (and energy retrofit grant recipients) occur in these bunching areas on the favorable side of the BER letter threshold. The bunching is strongest at thresholds corresponding to a change in letter grade, with the highest levels of relative bunching occurring at the B3/C1, C3/D1, D2/E1 and F/G thresholds. This suggests that greater emphasis is placed on a property achieving a more favorable letter grade assessment than achieving a more favorable alpha-numeric grade within a specific letter grading, e.g. C2 versus C3. Understanding whether the bunching is real and reflects accurate assessments of properties’ energy performance or the result of illicit activity is important. 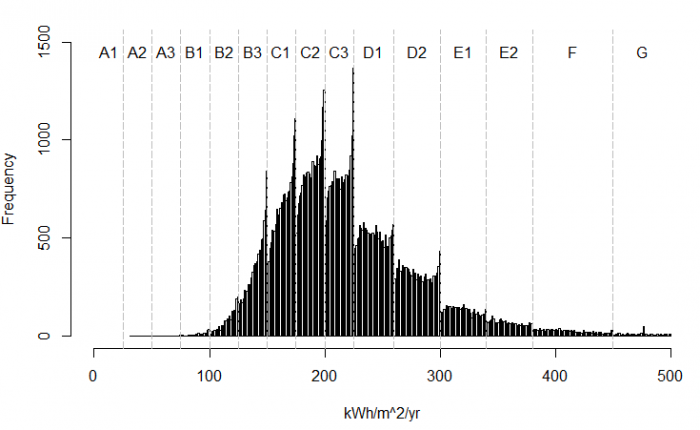 If the bunching reflects reality then dividing the continuous BER rating (in kWh/m2/year) into a 15-point scale has achieved a beneficial outcome of encouraging home-owners to upgrade their homes beyond the next attainable threshold. If the bunching represents illicit activity the associated price premiums constitute a fraud on buyers or renters. If the bunching is due to illicit activity, it will be associated with specific BER assessors, but there is no empirical evidence that any specific BER assessors are more likely to have graded properties in these ‘bunched’ BERs. What the analysis does find is that there is a close link between BER assessments in these bunching areas and higher installations of energy efficient lighting. 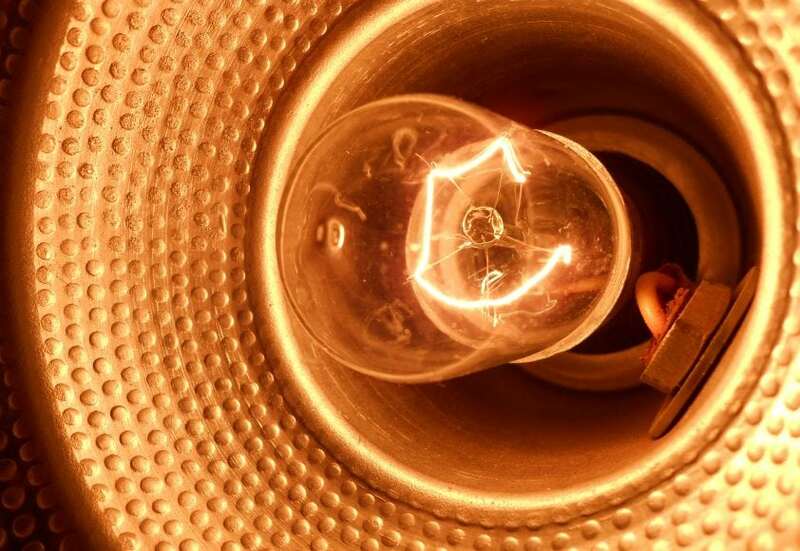 Due to its relatively low cost and ease of installation, low-energy lighting is an obvious route for homeowners to follow to ensure their BER assessment occurs on the favorable side of the BER letter threshold. While the analysis is specific to building energy ratings in Ireland, there are lessons for other countries. The presence of bunching in Irish BER ratings suggests that clearly identifiable thresholds within a continuous rating scale (i.e. kWh/m2/year) provides an incentive to homeowners to surpass the thresholds when they invest in home retrofits. These findings are described in the article, and Figures 1, 2 and 3 reprinted from Applied Energy, 211, Matthew Collins and John Curtis, Bunching of residential building energy performance certificates at threshold values, pages 662–676, Copyright (2018), with permission from Elsevier. This work was conducted by Matthew Collins and John Curtis from The Economic and Social Research Institute. Hyland M, Lyons RC, Lyons S. The value of domestic building energy efficiency: evidence from Ireland. Energy Economics 2013;40:943–52. https://linkinghub.elsevier.com/retrieve/pii/S0140988313001655. Stanley S, Lyons RC, Lyons S. The price effect of building energy ratings in the Dublin residential market. Energy Efficiency 2016;9(4):875–85. https://link.springer.com/article/10.1007%2Fs12053-015-9396-5. I am currently a Teaching Assistant in Advanced Microeconomic Analysis at master level and a TA in Economic Integration at intermediate level. My research interests lie in the economics of education. In particular, I am interested in how educational attainment and achievement are used as signals of productivity in the labour market and how these signals are affected by grade inflation. John Curtis is an applied micro-economist, with a focus on energy and environmental policy issues. He manages the Research Programme on Socio-economics of Inland Fisheries and is joint programme coordinator for the energy and environment research area. 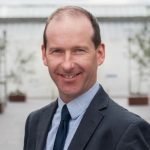 John is a member of the Royal Irish Academy’s Climate Change and Environmental Sciences committee; inter-departmental working group on economics for the Water Framework Directive; inter-departmental Water Statistics Steering Group; and the ESRI-TCD Alliance Steering Group. John joined the ESRI in 2011, and his former posts include lead economist at the Environmental Protection Agency, economist at the Environmental Defense Fund (New York), and previously as a Research Officer at the ESRI. He has a PhD in Environmental Economics from the University of Maryland, and both a BA and MA in Economics from UCD. John’s energy research focuses primarily on micro level issues such as residential energy efficiency but has also covered topics related to renewables integration and emissions. His energy research is published in journals such as Applied Economics, Energy Policy, Applied Energy, Economics of Energy and Environmental Policy, and Sustainable Cities and Society. On environmental issues his research has addressed topics related to water quality, fisheries, and resource management with papers published in journals such as Applied Economic Letters, Journal of Environmental Planning and Management, Journal of Outdoor Recreation and Tourism, Australian Journal of Agricultural and Resource Economics, Agricultural and Resource Economics Review, and the Economic and Social Review.